This marks my second time taking part in Great Eastern Women’s Run and I always felt that it is one of the most organized run I’ve participated so far. Last year’s run was the most enjoyable run because there were plenty of activities happening at the village right after the run. I remembered vividly that there were stalls handing out free apples, bananas, Subway sandwiches and other treats. This year there were fewer stores but like last year, it was organized. And check out their race pack! I signed up for the 10K marathon and though I didn’t really train for the race by doing lots of running but I did went for circuit training, thinking that I would go for the spartan race (which I didn’t as I was ill.) But I guess those circuit training has helped me improve my stamina and endurance. I actually ran faster this time round as compared to last year! This year I took part alone which I felt that it is a much better option for me as I didn’t mind completing a long journey on my own at my own comfortable pace. I could have taken the train but I decided to cab down so that I could reach there punctually. I squeezed my way to the front to join the pacers. There were 3 different groups of pacers holding up the different timings : 1 hr, 1hr 10 min and 1 hr 20 min. My timing was 1hr 30 mins last year and I thought I could aim for 1hr 10 min so I made sure I am running ahead of the ‘1hr 10 min’ pacers. I was running far ahead of them until they caught up in the last 3 KM of the run. When they ran way ahead of me, I was on the verge of giving up that target and decided to continue running at my own comfortable pace. To my astonishment, while I was approaching the finishing line, only 1hr and 9 mins has passed after the run has started! So I dashed across the finishing line just before the number on the digital timer changes to 1hr 10min. Yes! I did complete the race in 1hr 10mins! That is to say that those pacers probably reached there 5 to 10 minutes earlier. I had access to the VIP area as part of the media. I was already exhausted and hungry after the race. I was hoping for more healthier options at the VIP area but I was greeted with huge trays of fried food. There were several fringe activities happening at the race village but I decided to head home after the run as there weren’t much interesting events that appealed to me right after my race. The queue for the massage was long! But I wondered who would actually want a massage right after a marathon? When they are all so hot and sweaty. Great Eastern also took and uploaded our photos which we can get access to with our bib number. This photo is certainly more memorable than the finisher medal I received with an unripe banana and bottle of sparkling water. I actually couldn’t wait for next year’s GEWR and I hope to join their GEWR Buddy programme where I could join their fringe activities leading up to the race day. 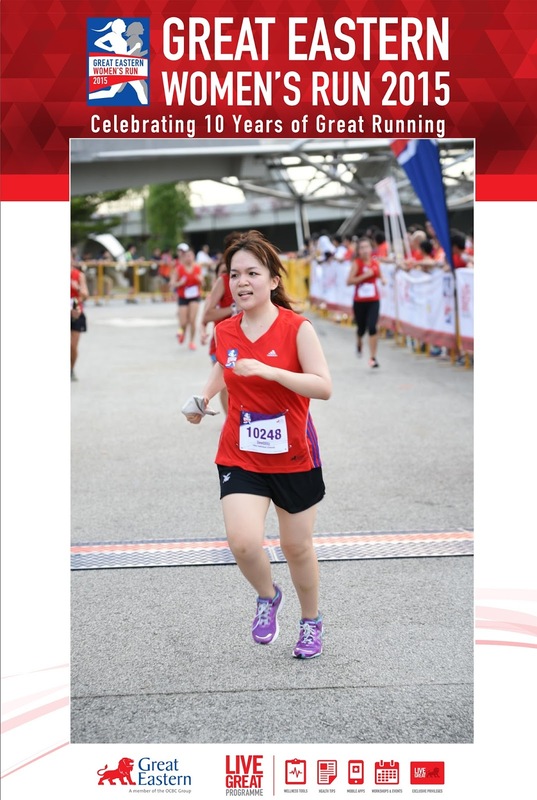 And I hoping to join the 21.1KM race next year!